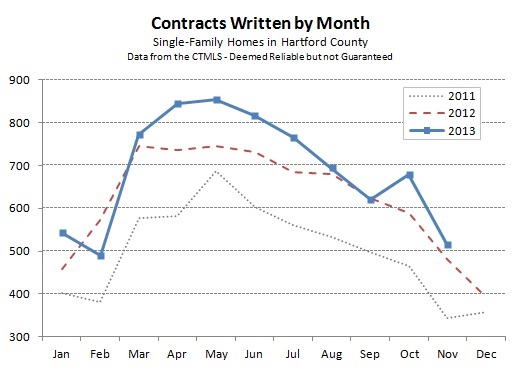 Single-family contracts fell to 514 in Hartford County for the month of November. The month was about 6% higher than the total from November of 2012, and the year-to-date count remains about 7% ahead of the 2012 pace. Agents we know have commented that there were parts of November when the market seemed suspiciously quiet – like so quiet that they didn’t trust their email was working properly. Despite that, the month ended with a solid deal count, which seems like a good sign. Barring a dramatic turn of events in December, it appears that the year will end with a modest increase in market activity over 2012. We continue to see deals come together this month, but don’t have a good sense of how active it will be. The weather and the distribution of the various holidays always seems to play a factor. Next month we’ll take a deeper look into the 2013 full year data to see what trends emerged and what they suggest for 2014. 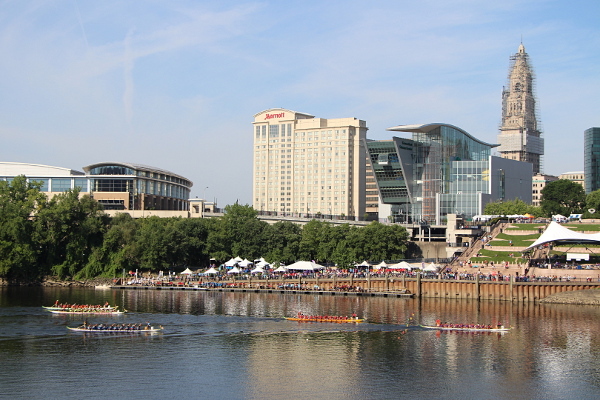 We’ll also investigate pricing data, which we think should only be considered on an annual basis since the mix of homes sold within a particular month or quarter contains a meaningful element of randomness. Annual data also needs to be closely monitored for changes in sales mix, but with the larger number of data points the changes are more likely to mean something. 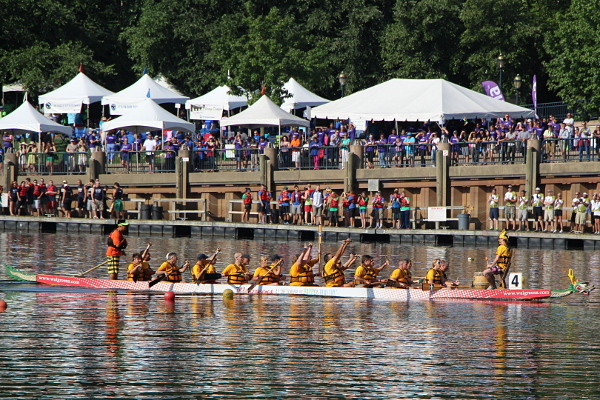 This weekend is the 2013 Riverfront Dragon Boat and Asian Festival at the Mortensen Riverfront Plaza. 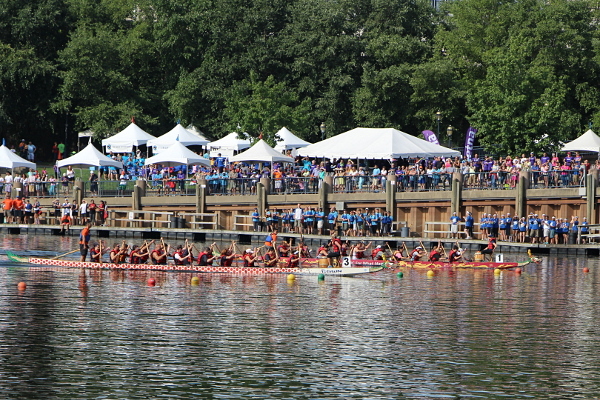 Here are some images from this morning’s qualifying heats. 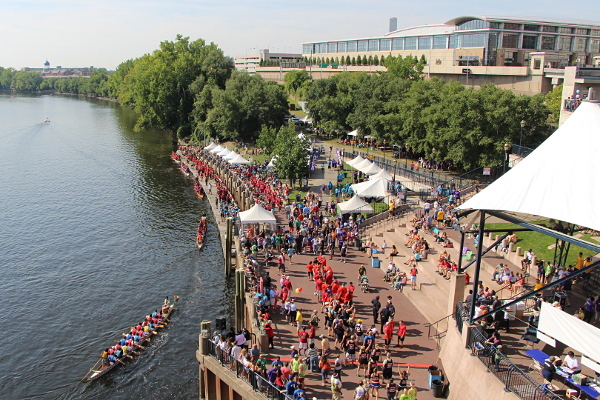 Looks like the races run all day Saturday and Sunday, so there’s still time to see the boats in action. 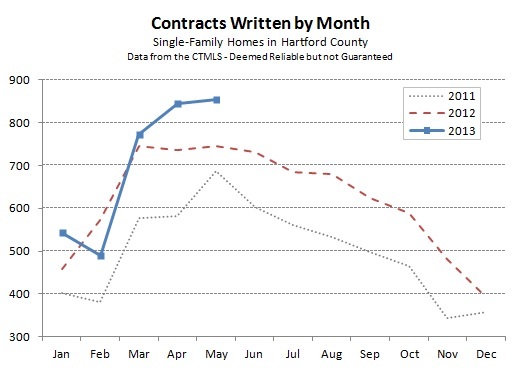 Hartford County single-family contracts edged up in May to 855 deals, a 1% increase over April of this year. 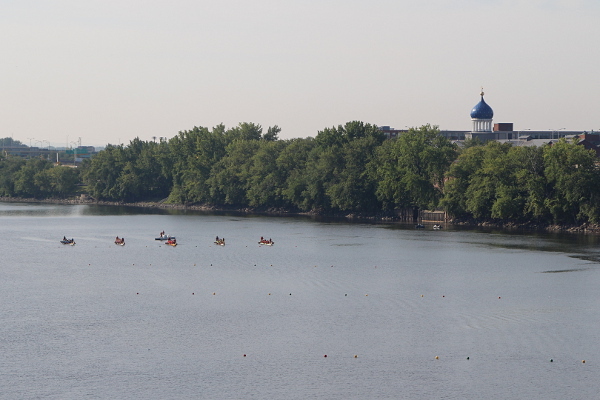 More impressively, the month was more that 14% more active than May of last year. The active season extended later into the spring before the deal count plateaued. 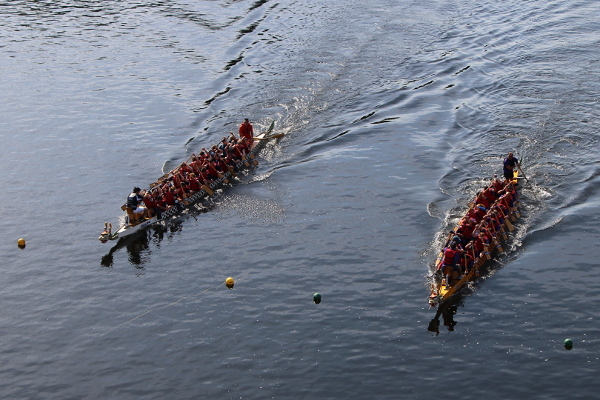 Through May, the market is more than 7% ahead of the 2012 market in terms of deal count. 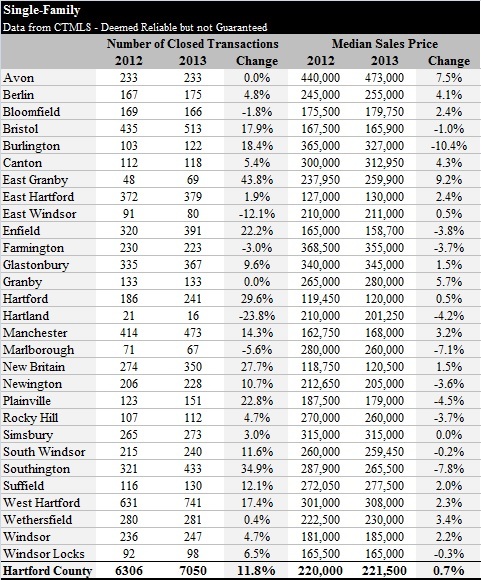 Drilling down into the individual towns, the numbers bounce all over the place. Manchester showed the largest increase in the number of deals, with +32 over May of 2012, and 76 total contracts. 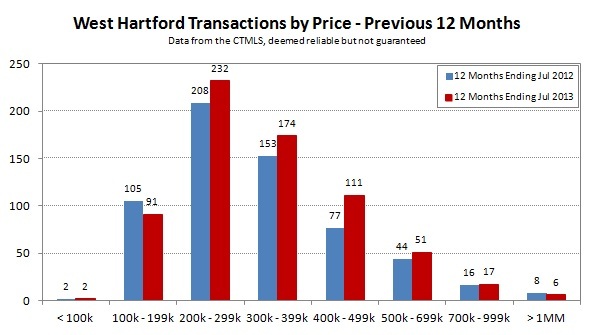 Five other towns had double-digit increases in deal count. 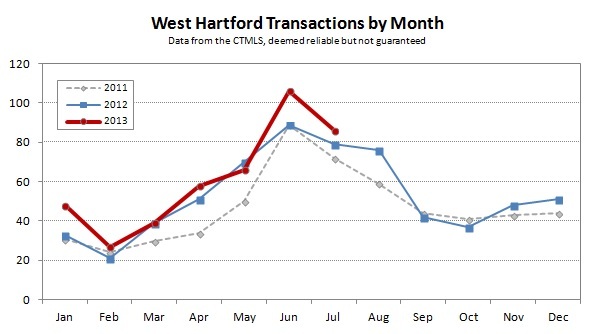 West Hartford was the most active market in May, with 102 deals, though the town was actually down slightly from the May 2012 activity level. 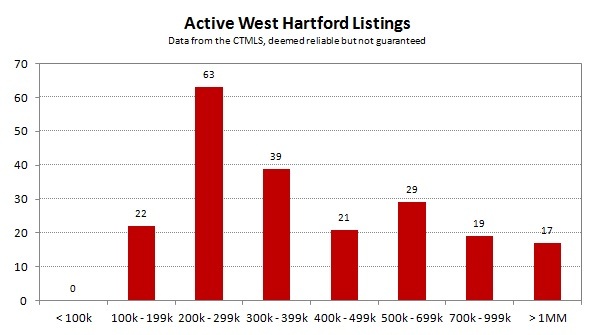 This result in particular, when combined with the County-wide 14% increase in activity, suggests that we’re seeing more widely distributed market strength in the Greater Hartford region. 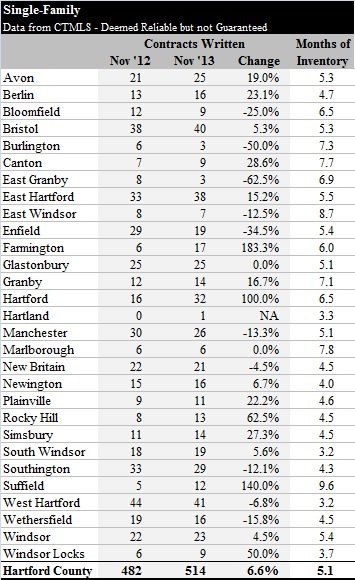 Last year increased buyer activity was concentrated in specific towns, some of which even saw price increases. This year it feels like more towns are turning the corner towards a recovery, and are seeing the benefits of increased buyer activity – more deals and the potential for rising prices. Inventory of available homes in the County increased from 5.0 months to 5.4 months, as the number of homes on the market increased from 3,153 to 3,465. South Windsor continues to have the fewest options for buyers, followed by Newington and West Hartford. As agents actively working with buyers in all of these towns, we can confirm that it is difficult to find quality properties for buyers. And when they are listed they can attract interest from multiple buyers, we had a client involved in a bidding war in South Windsor just last week. 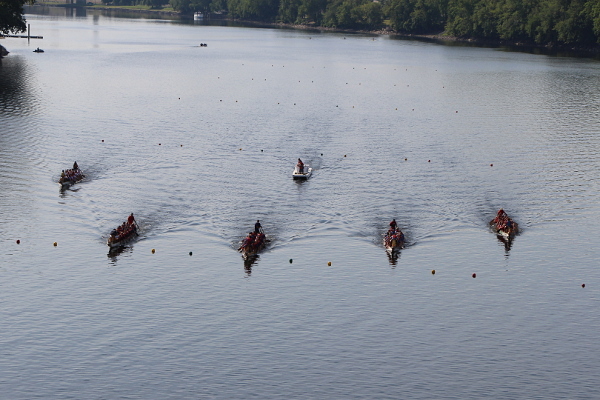 As we move into the summer months, we’ll be looking to see how quickly deal activity falls off. The top chart shows that in 2012 it was a gradual decline through August and then a sharper drop through the end of the year. 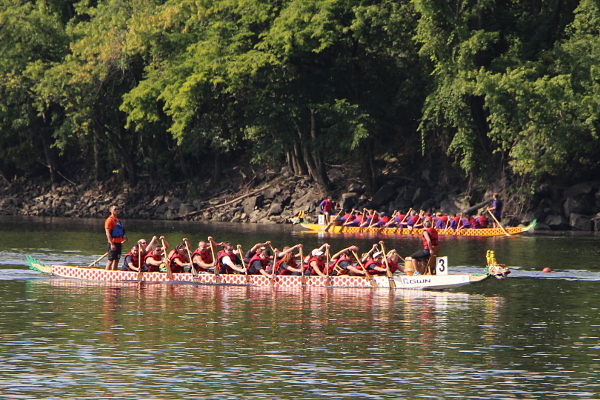 Or will 2013 look more like 2011?